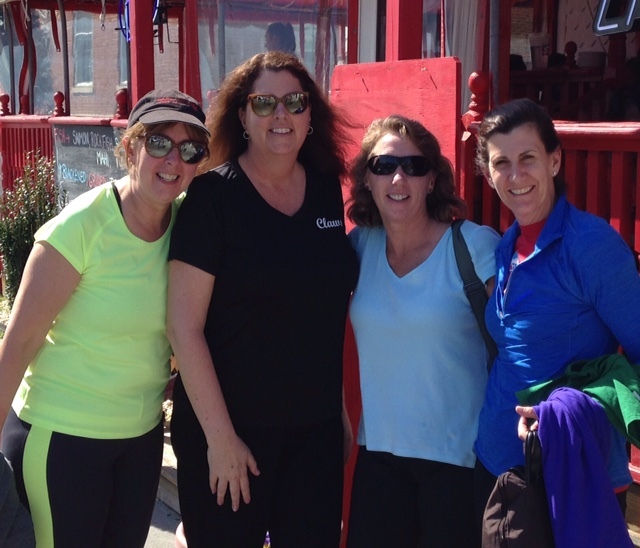 Several weeks ago I contacted Peggy Anne because the Hubster was going out of town on business and I suggested we have a girls weekend…as it turns out a weekend plan had already been in the works and I was so fortunate to be included. 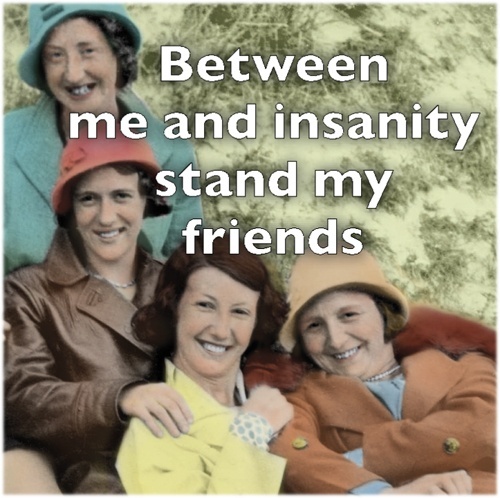 Peggy Anne has two friends, Judith* and Carly* from high school who graciously have embraced me in their circle. Judith* and her man, MC* own a condo in Bethany Beach. 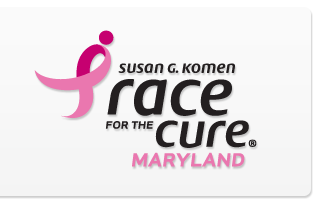 The girls signed up to walk in the the Susan G. Komen Race for the Cure. I, of course, gladly accepted the invite and joined in on the fun for a good cause. In memory of my Aunt C. and Aunt T….in celebration of a survivor…Peggy Anne’s, sister Lee Ann. On Friday, immediately after school I drove up I-95 to meet Peggy Anne at her home in Newark, Delaware. Together, we drove down to Bethany Beach, Delaware to Judith’s lovely condo. 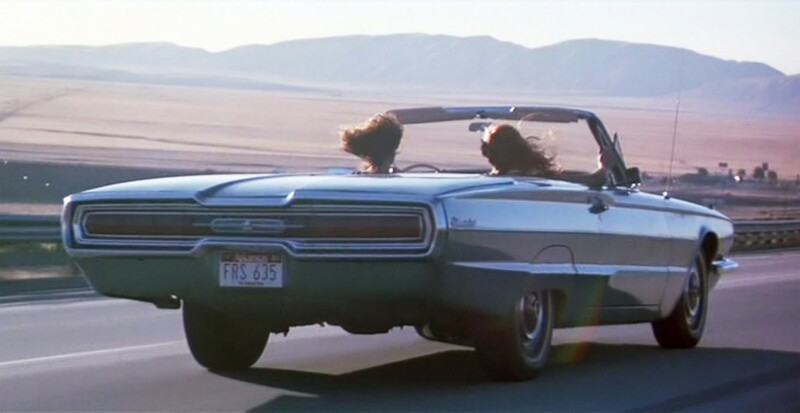 I know what you are thinking, a regular Thelma and Louise only younger, better looking, without weapons and no Brad Pitt. 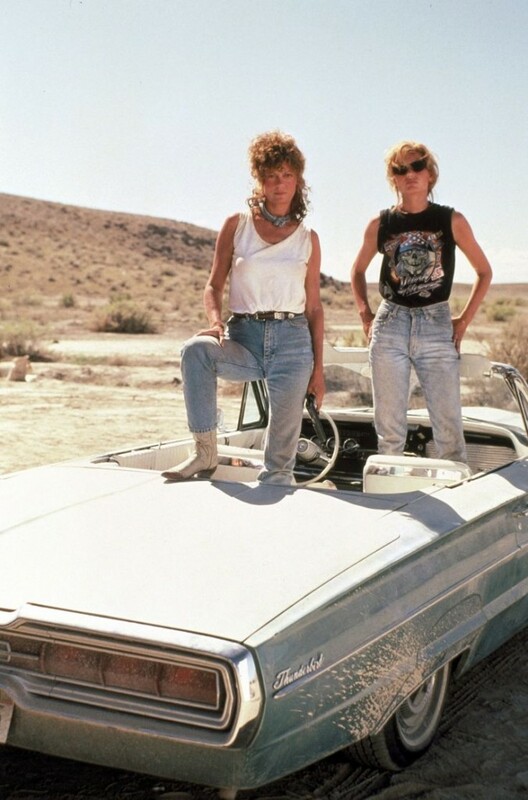 I am Geena Davis and she is Susan Sarandon. Our mom jeans are much cooler than these as ours sit lower on the hip. On the drive down, Hubster texted me not to talk too much because we might run out of conversation topics when we arrived…I am fairly certain he was joking because we never run out of things to discuss….to prove the point, when we arrived we said our hellos sat down at the dining table and observed not one moment of silence until we went to bed; unless you count chewing, swallowing and drinking. We even talked while we were brushing our teeth…dental hygiene cannot be ignored. Saturday arrived as an absolutely gorgeous spring day. I am happy to report that all the talking exhausted me and I slept until after 7 am…I felt like a teenager again, minus a PM Saturday wake up time and drama regret. As I descended from my sleeping loft, I spotted another reason for my restful sleep. Judith and MC have a wonderful guard dog, Roxy. I am a true believer that when you feel safe you sleep so much better. 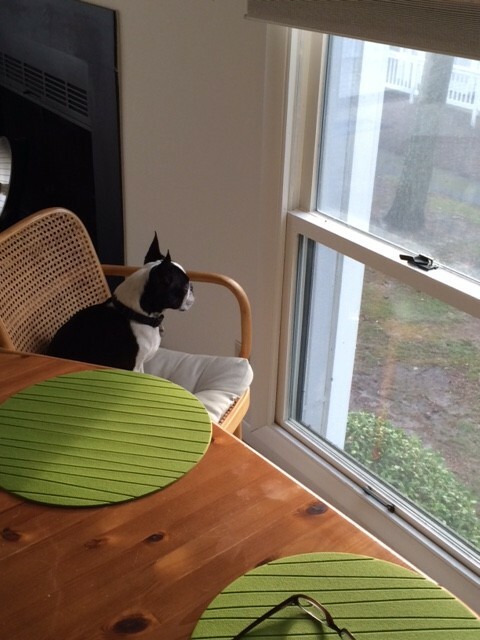 Check out Roxy keeping an eye on our well-being and securing the perimeter. She is fearless and thinks she is bigger than most other wildlife. 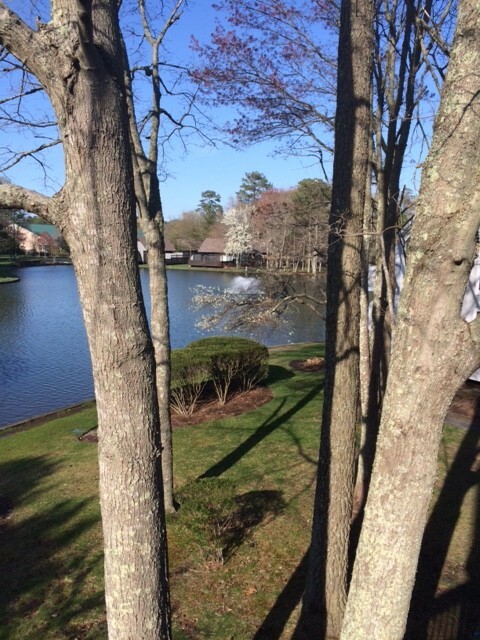 Absolutely beautiful day…spring blooming all around. 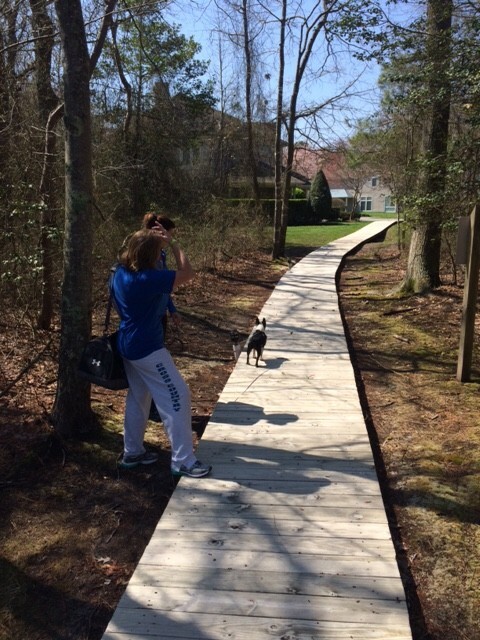 We took a leisurely walk around the complex with Roxy as our guide…there were many trails to explore. Judith and Carly pause as Roxy guides us towards the townhouse condos squirrel taunting her from afar. In the afternoon, we decided to drive up to Rehobeth Beach to do some window shopping and eat some lunch. 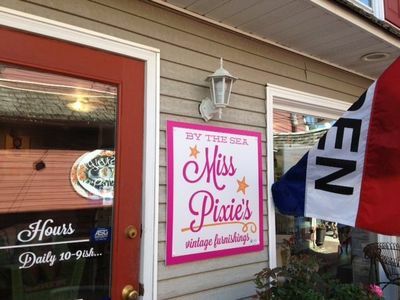 Our first stop was Miss Pixie’s Vintage Furnishings. Peggy Anne and Pixie were good friends back in the 80’s when we worked summers for the Phillips family in their seafood restaurants in Ocean City , Maryland. An eclectic shop with lots of ideas for home decor. Pixie also has a shop in DC. The window shopping and walking found us famished so we wasted no time finding a restaurant to meet our immediate needs…beverage (the adult kind) and food. 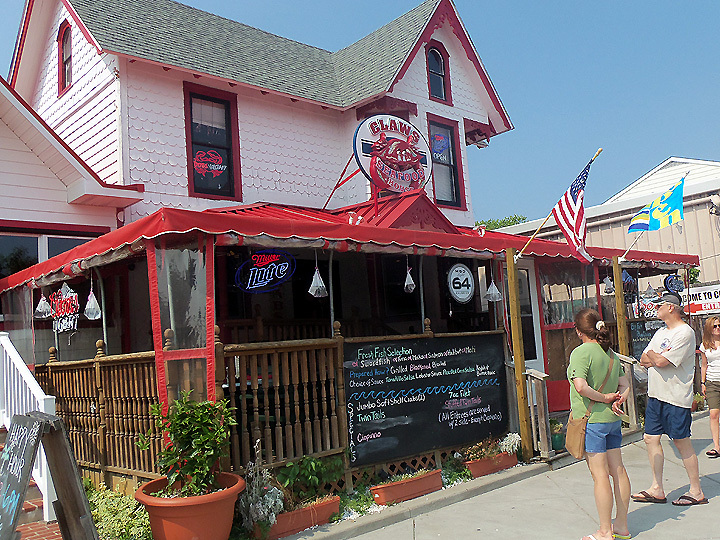 Rehobeth has many restaurants and shops along the main street. We ate on the porch. 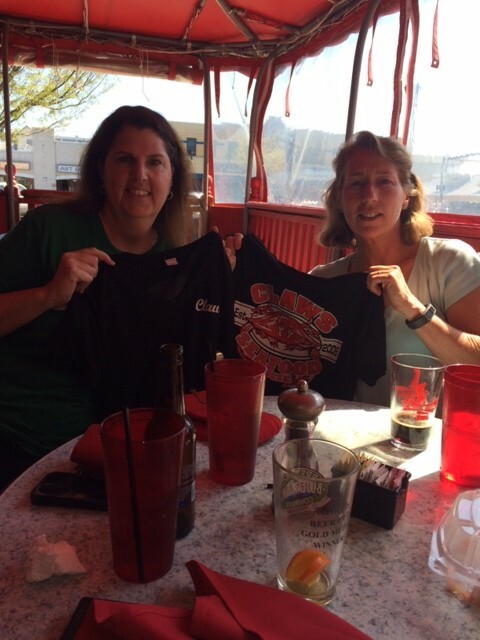 Peggy Anne and Carly show off their new tee shirts, because sometimes you can meet all your needs in one place…eat , drink and shop. Once outside, it was time for a “photo op”… you can just imagine the number of tourists who didn’t want to take our photo. L-R: Me, Peggy Anne, Carly and Judith…glamour is our middle name. Once safely returned to the condo, it was determined we did not have enough tonic water for medicinal purposes. 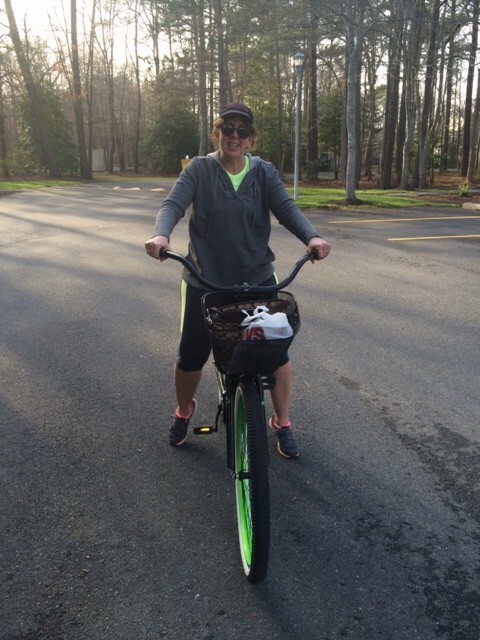 Judith and I hopped on her bikes for a quick ride up to Route 1. Many of the shops are still closed for the season, but we persevered and met our goal. Tonic water and purse safely in basket. The Sunday rise and shine came at an earlier hour due to our participation in the Walk for the Cure. 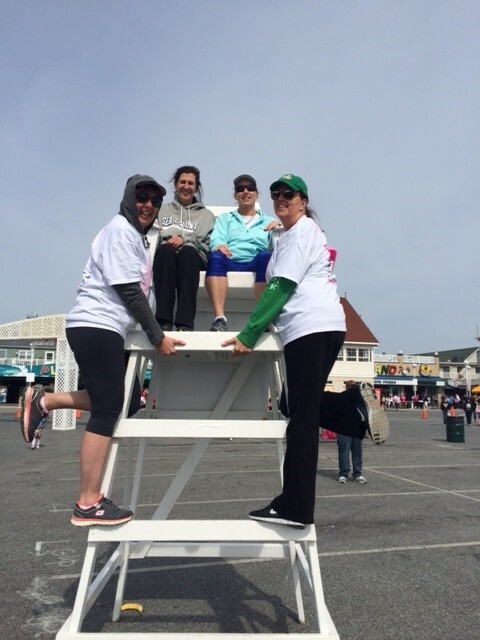 Peggy Anne insisted that we try to make Mass before the walk, but sacrifices had to be made to secure a parking spot in Ocean City. We parked right across from the Baptist Church so we decided our obligation was met. 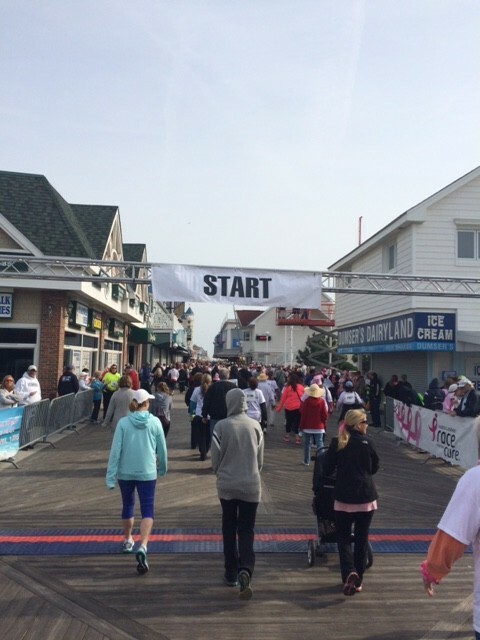 The walk began at the inlet in Ocean City. Carly and Judith in the mint and gray. I have never participated in this event before Sunday. Many teams go all out in the costume department. 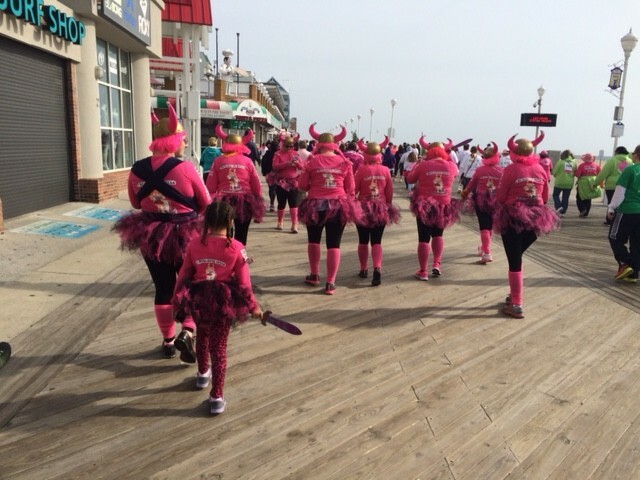 The hot pink Vikings were a favorite. The air temperature on Sunday right along the ocean was a bit cool to say the least. We didn’t let that stop us from having fun and recognizing just how lucky we were to be healthy and take on this brisk walk in support of others. Look… I still don’t have Instagram, but I can pretend. In just a few short months, I will be sitting on the beach. With the photo sessions behind us, we headed back up to Bethany for some coffee and breakfast. It was also time to get the condo back in shape after we enjoyed it all weekend. Time for us to head back home. I have been home since late Sunday afternoon, but my mind continues to drift back to the weekend. School Year 2014 -2015: DAY 139, only 41 to go…somebody has to keep track of this data. 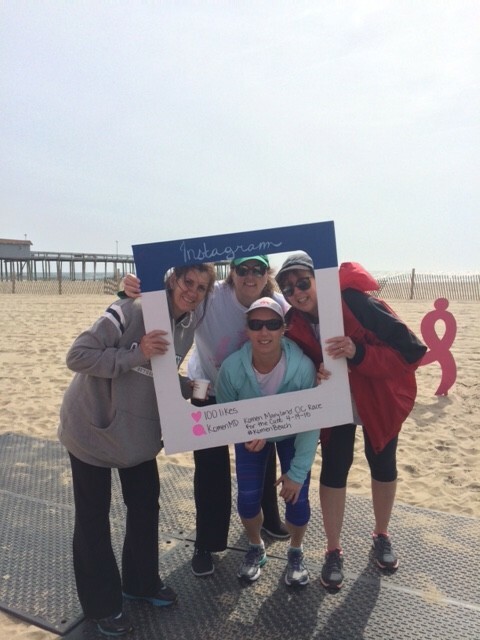 This entry was posted in Travel, Uncategorized and tagged Bethany Beach, Instagram, Rehobeth Beach, Walk for the Cure. 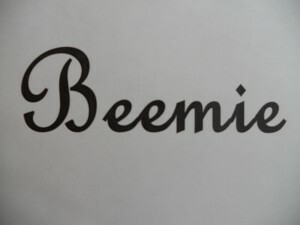 Beemie… Looks like such a fun weekend!! Glad you had great weather. Enjoy the rest of your week! Fun doesn’t even begin to describe our time. Have a great week also. Yes…it was glorious..hope you get together with your friend soon. #somuchfun!!!!!!!!! Oh, how I loooooove a good galpal trip. Nothing is more relaxing even tho you never really rest with the girls! Last fall when my girls and I went to a secluded Florida beach, I told them the best part about the whole week was never having to hold my stomach in!!!!!! So happy for your renewal…..
Oh my gosh… holding the stomach in can only last so long..would much rather go with friends…love it.